Albert Scales (c.1893‒1916), Lance corporal in the Cambridgeshire Regiment, fell ill while awaiting shipping to the Western Front and died of tuberculosis on 14 August 1916. He is buried in this Cemetery. 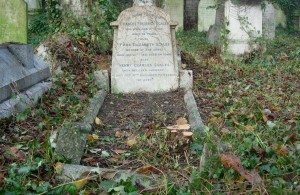 Albert was the son of Henry Charles and Emma Elizabeth Scales (both buried in this grave) of 5 North Terrace Cambridge. The census report for 1911 gives his occupation as scientific instrument maker (apprentice), whereas the Cambridge Independent Press reporting his death states that he was an assistant at Ryder & Amies, University outfitters in King’s Parade. There appears not to be an entry for him in the War Graves Photographic Project.